On the musical stage in 1856 Lori Ann a singer extraordinaire impresses the audiences with her voice. Male admirers line up for a chance to meet her. An enamored Zeke Kincaid is one of them. A dominate man as well as honorable he proposes marriage and foolishly she refuses. Once a Kincaid man chooses his mate it’s a done deal as far as they are concerned. Zeke does the only thing he knows. The same as many men in his family before him have done. He spirits Lori Ann away, and begins to train her to be submissive and obedient in the Kincaid tradition. In all ways Zeke can think of Lori Ann will learn to please him. He will return to the town of Paradise to finish her training. All goes well until the day Lori Ann vanishes. No one could accuse Ezekiel Kincaid of not knowing his own mind. A mind once made-up he stood behind with every inch of his six-foot-four inch frame. Another thing no one could accuse him of was not taking his time to find the right woman. Thirty-two years it took him to get here. The small black box scooted across the table propelled by Ezekiel’s strong unfailing hand. The woman across the table from him stared down at it. A smile from her set his heart to beat faster. He thought she was beautiful. She was young. She was enthralled with him. The young woman blushed. Zeke’s thoughts traveled down a road that told him she’d have a hell of a lot more to blush about once he had his hands on her. It wasn’t a suggestion. Ezekiel Kincaid demanded she do so. Lori Ann Baxter never met the likes of the man whose table she shared, so she didn’t recognize the difference. Slender well manicured fingers gingerly picked up the velvet the box. The hinges stiff from the newness as it seemed to resist opening. If it made a sound it could not be heard over the noise in the room. Lori Ann expected earrings. Many men before Mr. Kincaid gave her presents. Earrings usually or a pin, but the contents of the case stunned her speechless. The raised eyebrow on the face of the man she addressed caused her to stumble. ‟I mean, Zeke, I’m speechless. I never expected you. I mean we’ve only known each other seven days. I... I... . The box closed with a snap. A snap that for the couple sitting there seemed to resonate through out the boisterous room. Lori Ann scooted the box back across the white linen table cloth. Back toward the man, whom no one ever dare reject before whether in business or his personal life. Ezekiel sat there statue still. Only the throbbing blood vessel near his left temple gave anyone a hint of the anger consuming him at the moment. Lori Ann looked sophisticated in the worldly sense of the word. In reality she lived a sheltered life, so unlike the personification of the woman people saw on stage. Zeke didn’t respond to her rejection. Instead he chose to look around the room. The smoke filed air greeted his lungs as he took a deep breathe to calm down. The riotous noise that moments before he ignored, now echoed inside his head. Gratefully, the lights became subdued. The odor of the candle wax and oil lamps blended with the tobacco haze as the stage hands extinguished them. Only the lamps above the stage and the numerous candles stretched across the edge of the stage remained lit. The stage took on a life all its own as it glowed, and the flames throwing their light danced when compared to the darkness now closing in around the tables and the rows of seats forming the audience. A woman trying emulate the famous Jennie Lind walked on stage. She even copied her walk. The orchestra played, "I can but weep" by Robert Shumman. The room quieted. The newest singer in a long sky-blue gown under the lights began to sing. "When looking on thine a-sured eyes�.."
Ah, now that woman could sing. Zeke thought. He meant, Miss. Lind not the impostor in front of the crowd. Zeke knew because, he’d been one of those who parted with two hundred dollars just a few months ago. Money, he considered well spent. Miss Jenny Lind sung her heart out for the crowd in New York City, and he sat in the front row. The vision in blue bowed and the room leaped to life with applause, cat-calls, and wild stomping of feet. Lori Ann finished clapping and turned to Zeke. An empty chair greeted her. Not that anyone noticed, Lori Ann sighed with relief. I enjoyed this book from the beginning it was a short fun read. That left me wanting more. I love the setting it transported me back in time and I loved it I loved the characters even Zeke in his demanding way. He knew what he wanted and was not taking no for an answer. Lori Ann well was stubborn in her own way not wanting to give in to Zeke but her desires won out. The characters were well rounded and had real emotion. At times I felt the same emotions that Lori Ann had felt and the same desires. 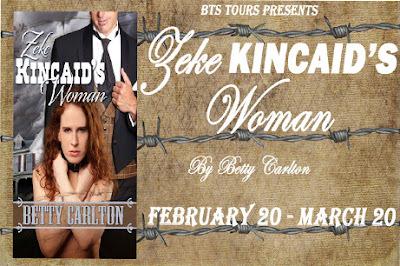 I am looking forward for more books about the Kincaid Men and their desire to have their women obey them no matter what. Lessons are learned in this read by everyone but who learns the most from their lesson? Sorry No Spoilers here so go and grab yourself a copy today. Betty Carlton is a time long resident of the tar-heel state. It was late in her life before she realized those pesky people in her head were characters who had something to say. Even though she loved to read being a writer was never on her ‘Bucket list.’ She likes to read fluffy romance novels where the duke finds his duchess or the cowboy rides into the sunset with his lady love to live happily-ever-after. Imagine her surprise, when she finally put pen to paper and discovered her leading men at times barely could be called a hero. Her stories have been referred to as dark, erotica, at times anguishing. She never had so much fun as when working the story lines. However, true to herself there’s always a happy ending. ‟Reading should take you away, but always leave you with hope. Anna you are making my TBR pile grow more and more!!! Thank you for the kinds words. :) :) :) There are 3 books with 4 KIncaid men and how they claimed and 'err' trained ther women. I think I probably do, but have yet to truly discover it. This sounds like an intense read...definitely I'm adding these to my list! Cool giveaways, great books, and wonderful thoughtful reviews! The best of all worlds...who could ask for more! :-) Thanks! Hmmm, using my real name so, that is between my lovers and I. Thanks for the giveaway! This looks like a hot read!